by Justin Madore I’m going to be honest: I was really dreading watching this. 2016 has been, at least for me, one of the most disappointing years for mainstream cinema. It feels like nearly all of the blockbusters and big-budget movies released this year have been severely underwhelming. The overall dependency of movie studios on franchises seems to be yielding less and less success, and for every Civil War this year, it seems like there have been two Ben-Hurs. Personally, most of the hyped mainstream releases I’ve anticipated this year have let me down (e.g. Jason Bourne, Star Trek Beyond). So, being as excited for Denis Villeneuve’s follow up to Sicario as I was, I still went into the theater with significantly tempered expectations. 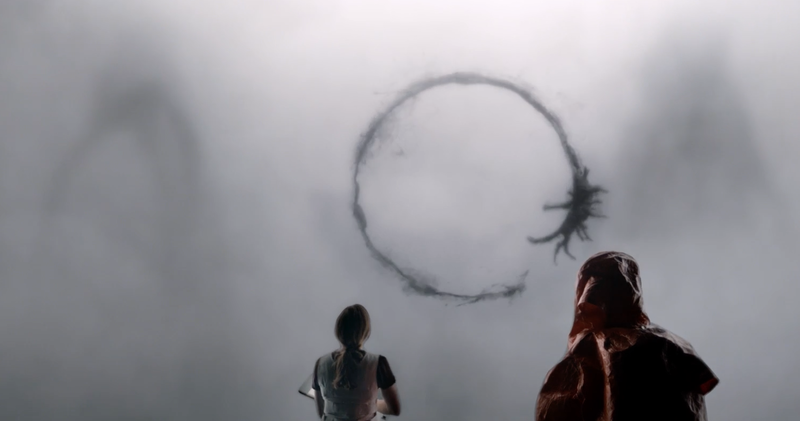 It brings me enormous pleasure to report that Arrival not only exceeded my expectations, but it left me with a profound feeling of awe at the magic of cinema that I haven’t experienced since last year. Arrival is the story of a first-contact scenario that subverts expectations. Aliens have landed their ships, which are called shells, in 12 different spots around the world. The main character is Dr. Louise Banks (Amy Adams), a top-tier linguist contacted by the military to establish communication with these aliens and find out what their purpose on Earth is. Villeneuve and his crew take this basic setup and create a narrative that is anything but clichéd. Based on that premise, it’d be easy to assume that what ensues is a tense action-thriller culminating in some sort of altercation between the military and the alien race. In actuality, it’s far from that. First and foremost, this is a story about language. Much like The Martian championed science, Arrival refreshingly champions communication above all else. As a linguist, Louise is the key to the interactions. As she begins to learn the alien language and teach them English, different words bring up memories from her consciousness. These memories help establish her character and give context to the meaning language has for her. The film also explores what language does to a person and how it can affect your brain. The language you speak affects how you think, and as Louise begins to immerse herself in this alien language, she starts to feel more like them. The way the script plays with the concept of language is fascinating and unique, and it smartly builds up to an amazing payoff. The film also deals heavily with themes of wonder and the unknown and uses its aesthetic to drive home a sense of somber mystery. Villeneuve has filled cinematographer Roger Deakins’s shoes nicely with Bradford Young, who’s been making waves recently for shooting Selma and A Most Violent Year. The visuals of Arrival are effortlessly elegant. The camera glides through the air like a wisp in the wind, capturing the scale of the alien’s shell, the plains surrounding it and the contrasting light inside the ship. Combined with a moody soundtrack that never borders on contrived, the atmosphere and tone seamlessly match the wonderment of the narrative. Of course, this atmosphere would be all for naught if the characters weren’t interesting and convincingly portrayed, but the cast is wonderful. Louise and Ian Donnelly (Jeremy Renner) are well fleshed-out characters that behave and react like real people. As a linguist and an astrophysicist respectively, they work together to communicate with the aliens, and the strong chemistry between the two actors makes it much more enjoyable to watch them piece the puzzle together. Forest Whitaker also gets a bit of the spotlight as the colonel who recruits Louise. His character is another example of how Arrival subverts expectations and proves itself to be a smarter-made film than one may anticipate. As a figurehead for the military operation, it would be extremely easy to vilify him as a shortsighted oaf that can’t wait to pull the trigger. Instead, we get a level-headed intellectual who has conviction in his own thoughts but is capable of understanding criticism when Louise tells him he’s handling the situation incorrectly. It’s impressive what Villeneuve has been able to accomplish with Arrival. He’s continuing to prove that he’s one of the most impressive and versatile filmmakers working today. Great science fiction is hard to come by, and he’s transitioned into the genre exceedingly well, making me that much more excited for next year’s Blade Runner sequel. Future potential aside, Villeneuve has finely crafted a science-fiction gem that exceeds his previous efforts. Arrival is the savior in the creative drought that’s plagued filmgoers all year. Tags: Justin Madore. Bookmark the permalink.